Great sports headphones can often be a bit hard to come by. Not only do they need to sound great, like every pair of headphones, but they also need to fit both comfortably and tightly so they don’t fall off when you’re doing things like running. Jaybird has produced some excellent sports headphones in the past, but now it’s back with a follow-up to one its most-loved pairs of headphones. Introducing the Jaybird Freedom 2 sports headphones. The original Jaybird Freedom headphones had a lot to offer to those looking for a great pair of sports-focused in-ear headphones. But they weren’t perfect. Do the new Jaybird Freedom 2 headphones fix the imperfections on an already-stellar option? We put them to the test to find out. The first thing you’ll notice about any new product is its design, and the Jaybird Freedom 2 headphones look pretty good. We’re reviewing the white version, but the headphones also come in black, which, judging by the pictures, also looks great. The in-ear units themselves feature a nice curved profile, which looks good — but unfortunately it has some serious negative implications for the headphones’ fit and comfort level. We’ll talk a little more about that later in the comfort section. Part way down the right-hand cable, you’ll find the control remote — which offers a volume up, volume down, and central multi-use button. You’ll also find a somewhat decorational-looking design on the back, which is actually where the charger connects to the Jaybird Freedom 2 headphones to charge them. That charger doubles as an external battery — so if you’re on the go you can connect the headphones to the charger and you’ll get double the battery life. On the back of the cable, you’ll find a few clips that come pre-installed, which is very nice. That’s the Speedfit cable management system on offer by Jaybird, and we found that it worked quite well — simply pull the small rectangles apart to tighten the system, or pull the cables outside those rectangles to loosen it. Easy. In the box, you’ll get the headphones themselves, along with a total of four ear-tips — which are ear-tips and ear fins combined into one. You’ll also get a short microUSB – USB charging cable, and the charger, which, as mentioned, has a built-in battery. Last but not least is a carry pouch. The curved profile of the in-ear units may look nice, but it has a pretty big impact on the overall fit of the Jaybird Freedom 2 headphones. That’s especially true when you want to hook the cable of the headphones over the ear — which, as the instruction manual mentions, the headphones are built to be able to do. The reason for that is that the curved design puts the cable out too far from the ear, so when you tuck the cable in towards your head, the in-ears themselves come out. We would like to see a design more like the Jaybird X3 headphones, which has an in-ear unit at a 90-degree angle. If you don’t wrap the cable around the ear, they fit decently well. The ear-tip/ear fin combo is a good idea, though it does remove some of the flexibility, and it does not seem as though there was much size variation with the actual ear-tips — more so with the size of the ear fins. We strongly recommend experimenting with the different sizes, and it may take a few minutes to do so. If you’re looking for headphones you can comfortably hook around your ears you may want to look elsewhere. So how do the Jaybird Freedom 2 headphones sound? Thankfully, they sound quite good, and the fact that you can tweak the sound using the Jaybird app only makes them sound better. By default, the headphones will use the “flat” sound profile, though you’ll also get a few other presets — and the ability to create your own. The bass on the headphones is pretty powerful, and while it doesn’t necessarily extend as deep as we might have liked, in general kick drums are nice and beefy, while bass guitars are nice and smooth in the mix. The mid-range is also relatively well-tuned. Low-mids are relatively warm and present, while high-mids are tuned with a slight bump in the 2kHz range — which can, of course, be tuned out if you so choose. The high-end is crisp and present, though we would have liked a little more clarity, especially in the upper range of the highs. Like with the bass, your control of the EQ ends a little too early for us. The soundstage on the headphones is decent though not amazing, and the headphones did not seem to distort unless at unreasonably high levels. 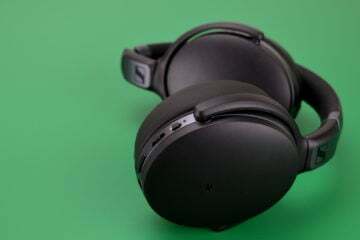 The headphones will connect to your listening device through Bluetooth 4.1, so you’ll get the standard wireless range of 10 meters, or 33 feet. We found that to be largely true for us, though it obviously will depend on things like obstacles. Battery life on the headphones sits in at 4 hours. I know what you’re thinking: “but the packaging says they’ll last 8!” That’s true — when you recharge them with the charger. The charger’s battery will allow you to give the headphones another full charge, but you obviously will have to wait for them to charge in the first place. The headphones themselves have a 4-hour battery life. 4 hours isn’t all that great, especially for a pair of headphones that have a wire and included remote. In fact, 4 hours is more in true-wireless range — proved by the fact that the Jaybird Run true wireless headphones, which we’re in the process of reviewing, also have a 4 hour battery life. The Jaybird Freedom 2 headphones have some great qualities — but they’re not perfect. We think they sound pretty great and have a really nice design. We love the Speedfit cable management system, which really makes tightening and loosening the headphones easy. But, they’re not perfect. Most of the issues aren’t deal-breakers, but if you’re looking for headphones you can wrap over your ear, then these probably aren’t the right ones for you. So what should you do if you want the best pair of sports-focused headphones? We would actually argue you should stick with the same company. The Jaybird X3 headphones are the best sports headphones we’ve tested, and for good reason. Still, thanks to their sound quality and nice design, we’ve awarded the Jaybird Freedom 2 headphones the Headphone Review Bronze Medal.